The HAYWIRE 14 FUSED WIRING SYSTEM is the harness for you .... if lots of power options and accessories are for your ride. *Ground Wires are included with this kit. Great for Fiberglass bodies. *Includes GM Connectors for Headlights, Headlight Switch, Turn Signal Connectors, Ignition & Dimmer Connector. Haywire 14 Fused Wiring System, Ignition Column & Dimmer Column / ea. Haywire 14 Fused Wiring System, Ignition Column & Dimmer Floor / ea. 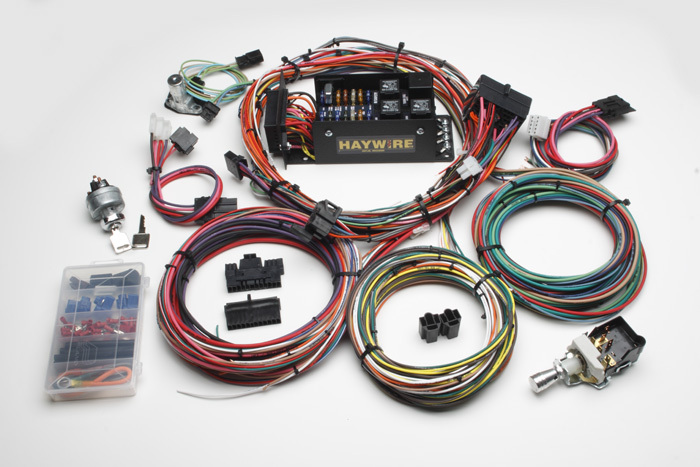 Haywire 14 Fused Wiring System, Ignition Dash & Dimmer Floor / ea.